The Bubbles Brunch features a soulful brunch buffet of craft foods inspired by a passion for open-fire cooking, provided by Executive Chef Morgan Robinson of Smoke. Guests celebrate the conclusion of the Yountville Live weekend’s events with an elegant sparkling wine and mimosa bar with fresh squeezed juices and local garnishes. The brunch will wind down with an intimate acoustic performance by a soul driven, up-and-coming artist. Purchase tickets and more information. We will be closing out Yountville Live for the second year in a row! The soulful brunch will be paired with soulful music in an up-close acoustic set by up and coming singer songwriter Kris Allen. Celebrate the the conclusion of the Yountville Live weekend’s events with an elegant sparkling wine and mimosa bar. This year Napa again pulled off another entertainment first by hosting the Valley’s biggest rock festival ever – BottleRock. 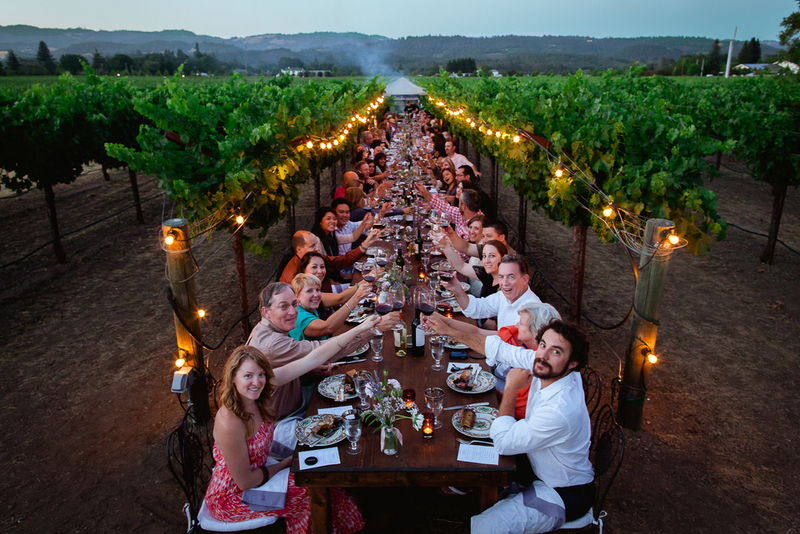 My catering company, SMOKE Open Fire Cooking, was stoked to be a part of the inaugural festivities, as one of the local food purveyors supplying the high-quality eats Napa is famous for. At BottleRock, our role as a local artisan food vendor was intense (due to the large crowds!) yet straightforward, so I was able to manage my team as well as greet friends, neighbors and industry colleagues who were also attending this mega-event. After my formal training at culinary school and more than 20 years of restaurant and catering experience, I know how to prep for an event like this: keep the choices simple, and the quality and presentation extraordinary. We offered three options for hungry BottleRockers: an Argentinean sausage sandwich called Choripan, hearty concert-going chow that pairs with a big Cab or frosty brew; a Grilled Hearts of Romaine salad for those seeking lighter fare; and from my own product line, Morgan’s Salty Nuts, bags of Smoked Almonds with Black Pepper, Sea Salt and Olive Oil, perfect as a portable snack for attendees moving from stage to stage to catch their favorite bands.